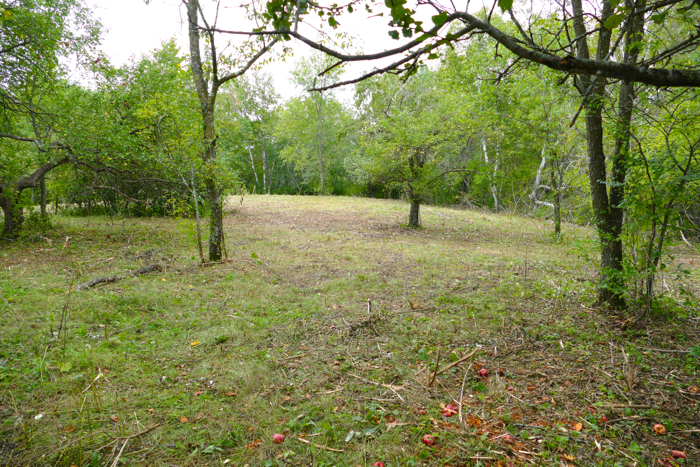 Mike did some brush mowing this week, on the bluff above and behind Sumac Prairie. 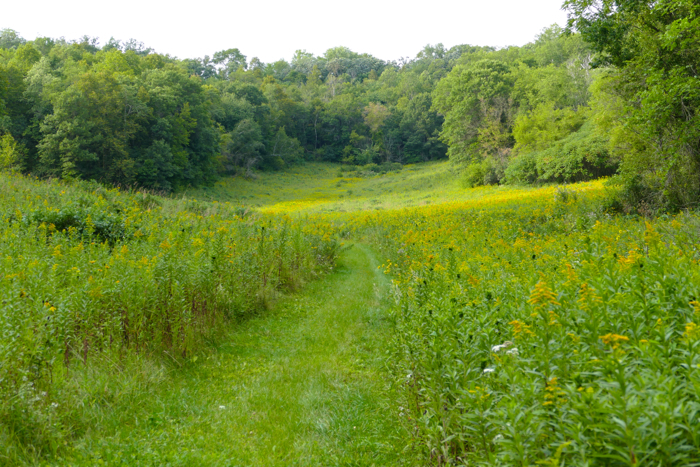 We’ve mowed back there before, but not for a few years, and only on the west side of our path. 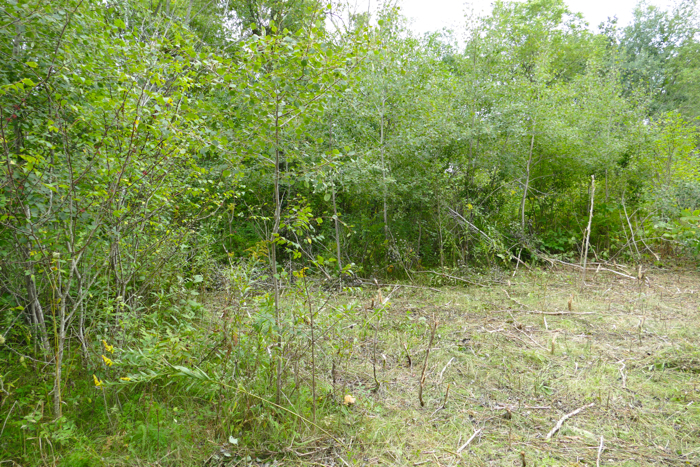 This time Mike mowed on the east side too – way back into some very thick brush – trying to ‘liberate’ some big oaks. 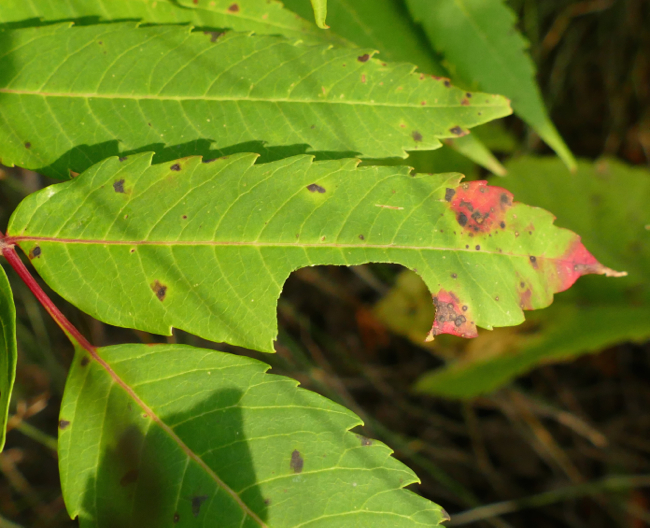 This is the kind of stuff he was mowing through – mostly Prickly Ash, small aspens, and birches. 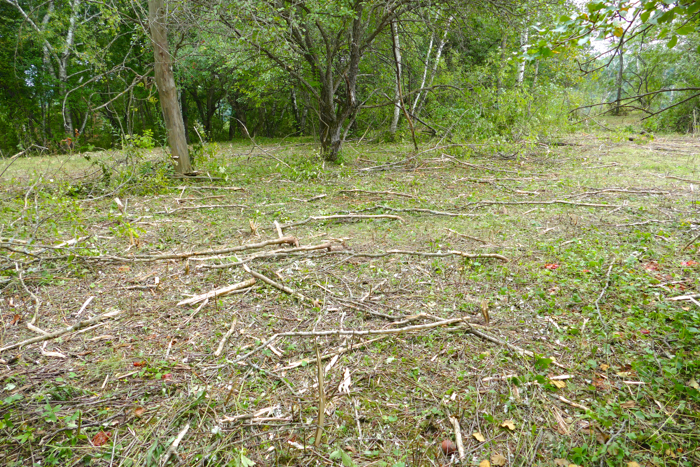 One of the scenes of destruction – the mower will cut even quite thick brush. Looking west from our path after mowing – this is the part we’ve mowed before, but not for several years. There are lots of apple trees in this area, so after mowing it, everything smells like apples. 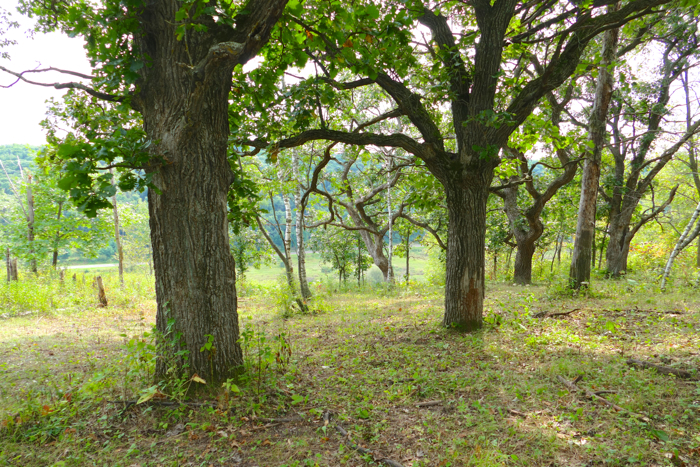 There are lots of big oaks – it was fun to see them out in the open again. 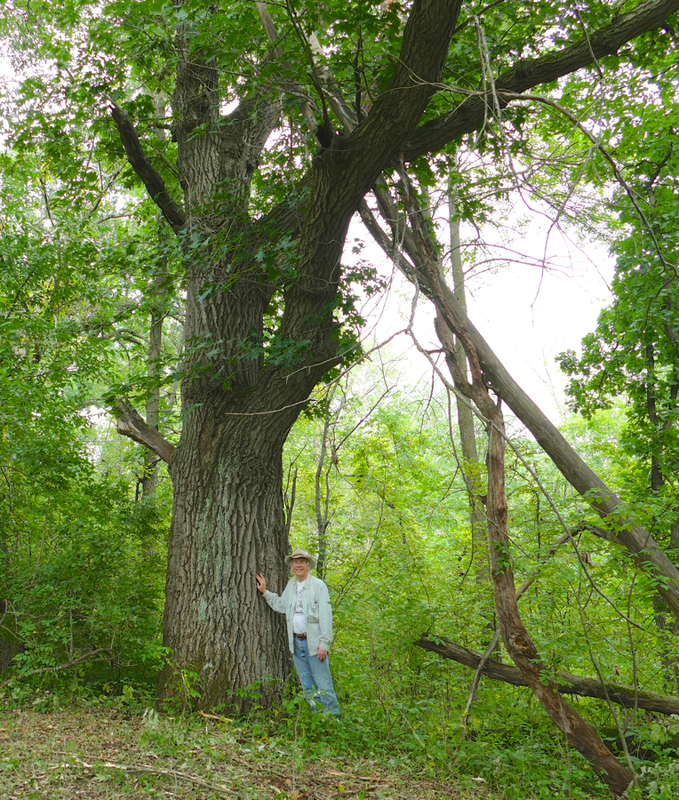 This was the biggest one – a huge Red Oak – much bigger than any of the other trees we’ve found here. 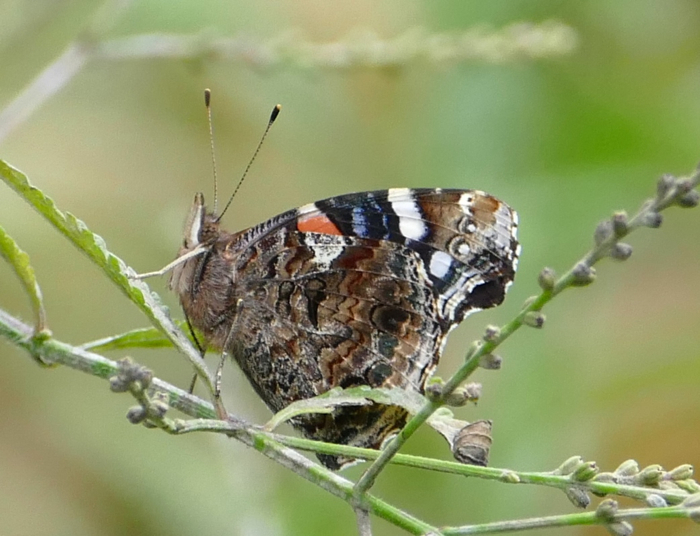 We hadn’t seen it before – it was way back from the path and had been completely hidden by brush. A friend sent us a way to estimate the age of various kinds of trees without having to count the rings. 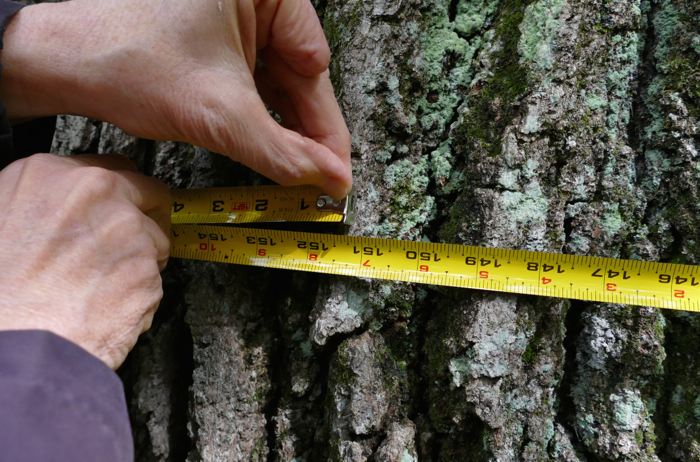 So we measured – it has a circumference of 151 inches! – a diameter of 48 inches. Using those calculations it should be about 190 years old – so it began to grow before this area was settled by Europeans. 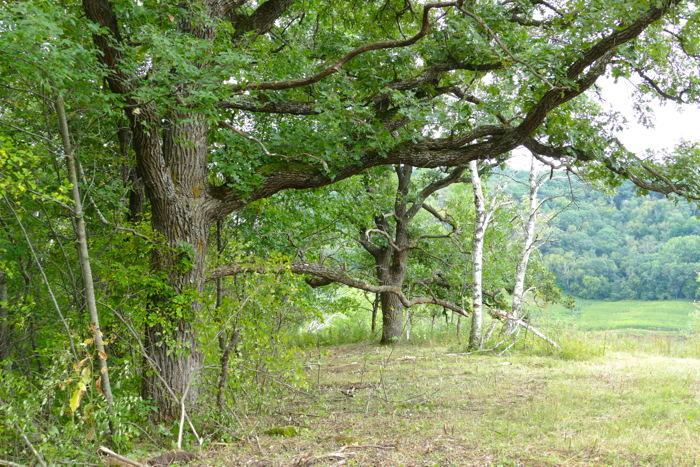 Here are a few more of the old oaks – not quite as big, but still (using those same calculations) about 140 years old. The Monarch migration seems much better this year than last. 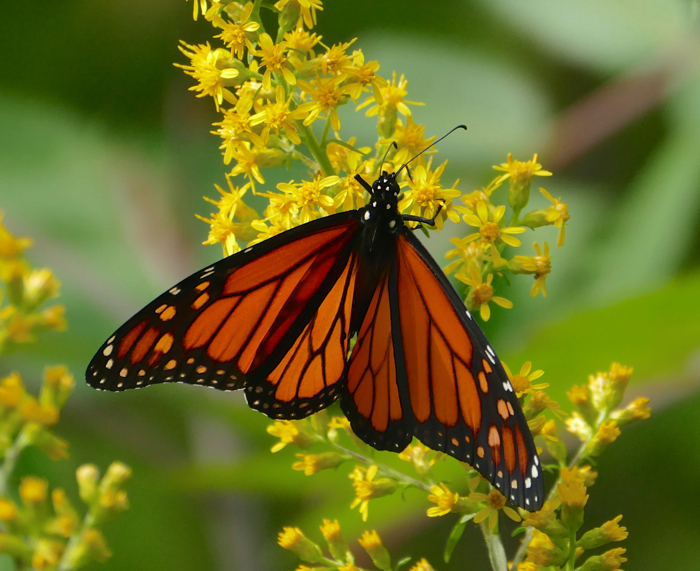 We’ve been seeing a lot of them – mostly nectaring on Showy Goldenrod. Even when there’s lots of Blazing Star (Liatris sp. 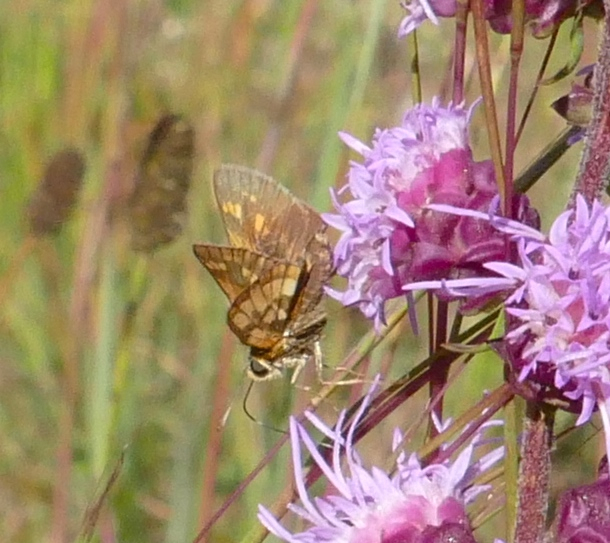 ), they seem to prefer Showy Goldenrod. 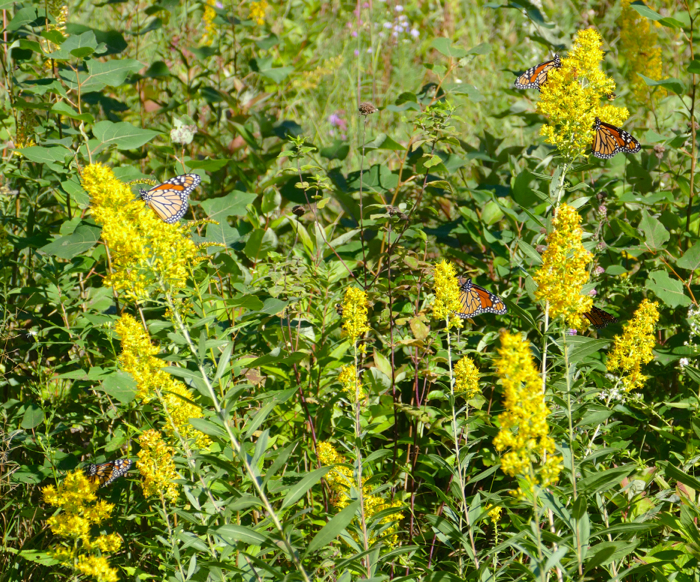 This Showy Goldenrod plant is in the Knife Edge Prairie, and it had attracted at least 10 Monarchs. 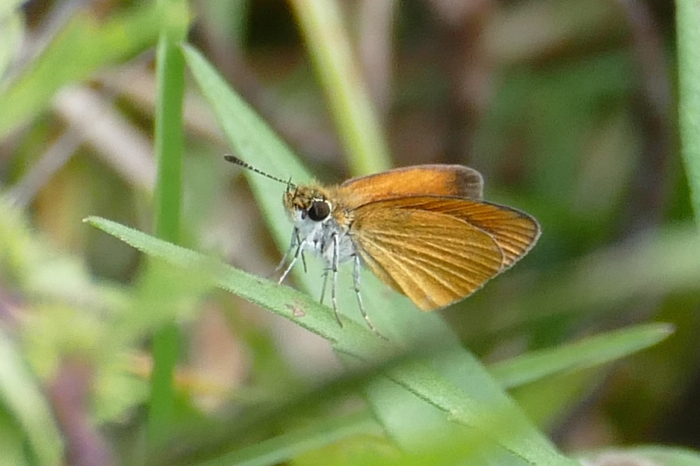 I’ve been seeing other butterflies too – this is a Least Skipper. 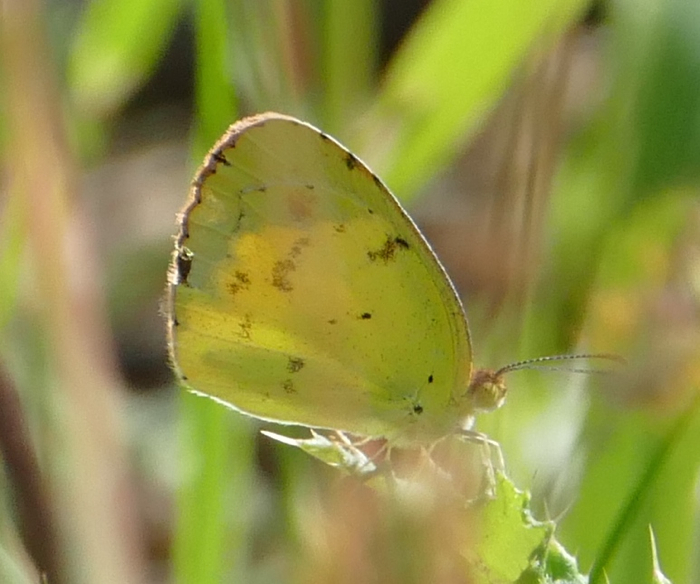 A Little Yellow – one that flies up from the south most summers. This is the first one I’ve seen here this year. Peck’s Skipper – a new one for the farm. 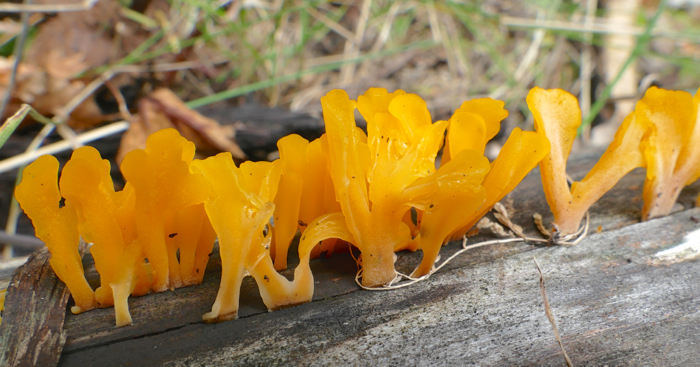 I’ve seen them in the Twin Cities, but never here before. I’ve been trying to pay more attention to bees – they’re much harder to photograph, and hard for me to identify. I didn’t get a photo of the bee that did this, but I did get to watch it. This curved piece was cut out of the sumac leaf by a leaf-cutter bee. It took me a minute to figure out what she was doing. She cut out the piece, curved it around her body, and flew away with it. She’ll use it to line a hole where she’ll place some of her eggs. She’ll put in an egg with some food for it, then use a piece of leaf to make a divider, then lay another egg, and make another leaf divider, until she has a line of cells, each with an egg and a bit of food. This is a new plant for the farm, and for Wisconsin. 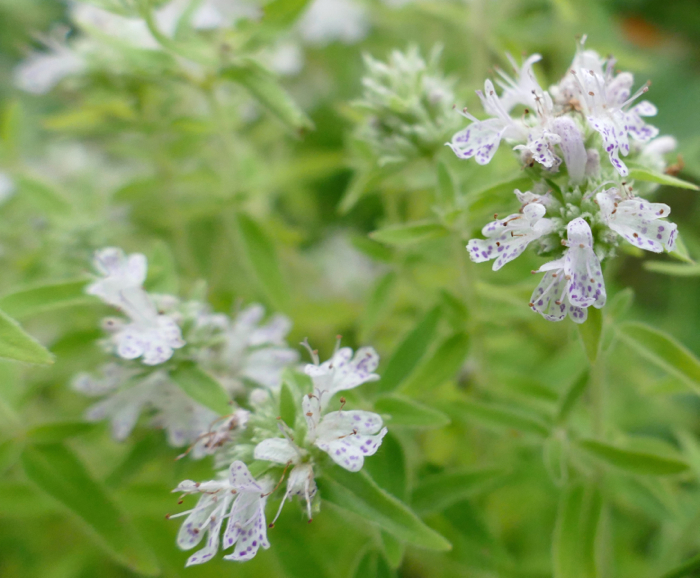 It’s a Mountain Mint – either Pycnanthemum verticillatum or P. pilosum I found it at the bottom of Hidden Oaks Point. I’m not sure if it’s growing here naturally, or if it came as a seed with some other seeds that I purchased when I planted our fields. 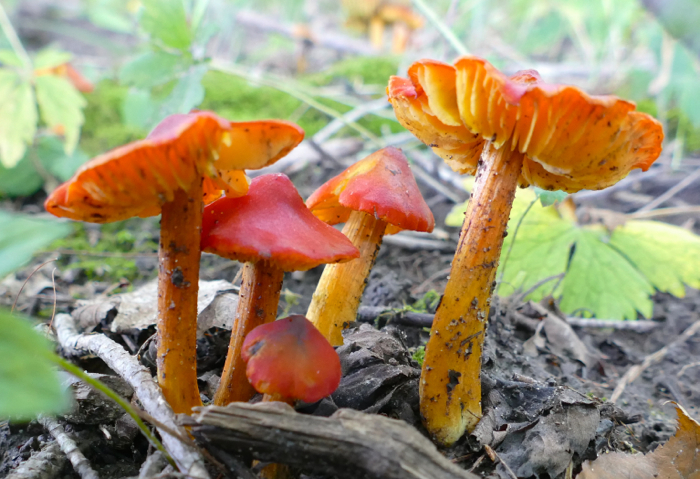 It grows just south of here – in Illinois and Iowa, but until now, not in Wisconsin. This is another plant that I think might have come as a seed along with other seeds I purchased. 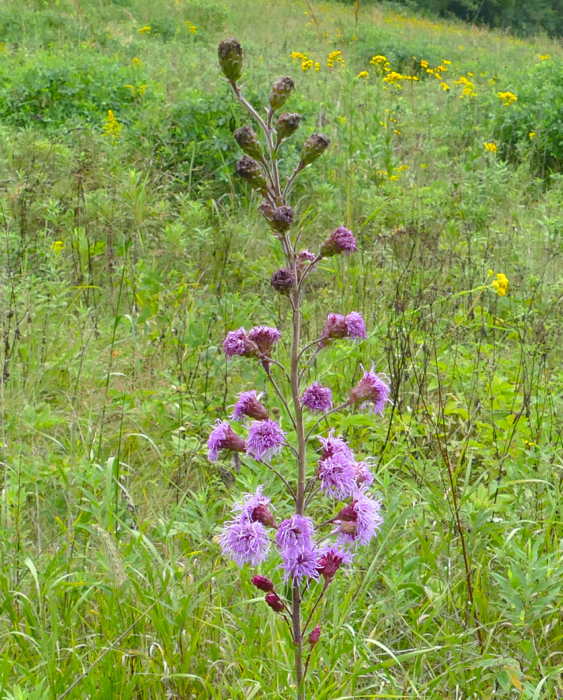 It’s Northern Plains Blazing Star (Liatris ligulistylis). I’ve seen only this one plant, growing in 3 Finger Valley. 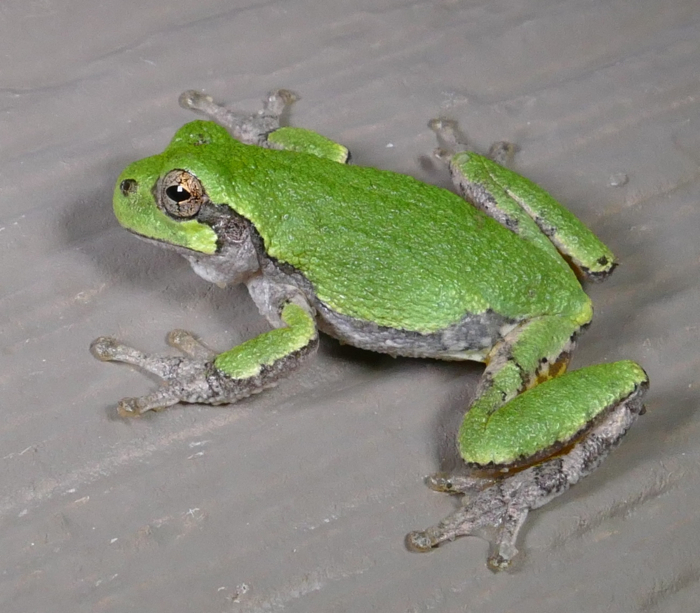 It is found in Wisconsin, but I’ve never seen it near here. 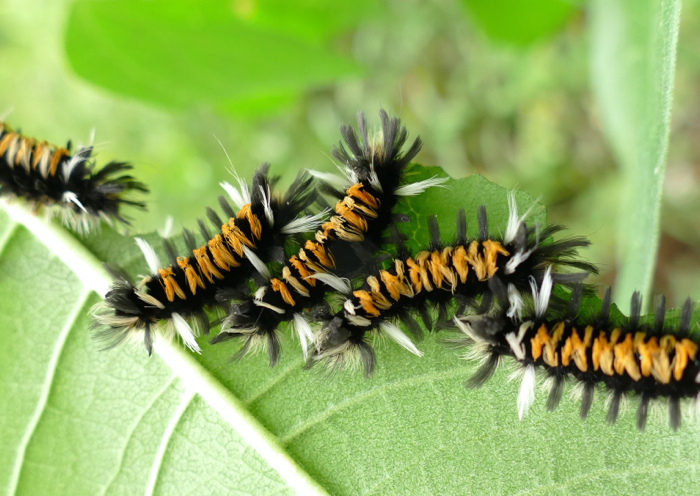 These are end-of-the-summer caterpillars – Milkweed Tussock Moth caterpillars. 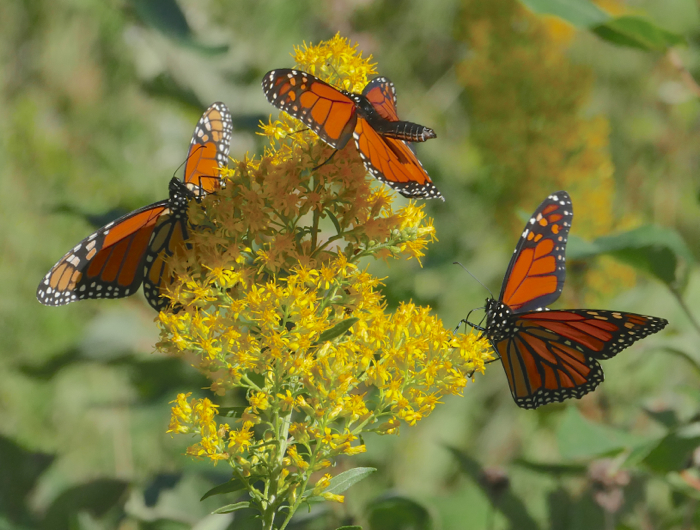 They eat mature milkweed leaves – not new fresh leaves like Monarchs. 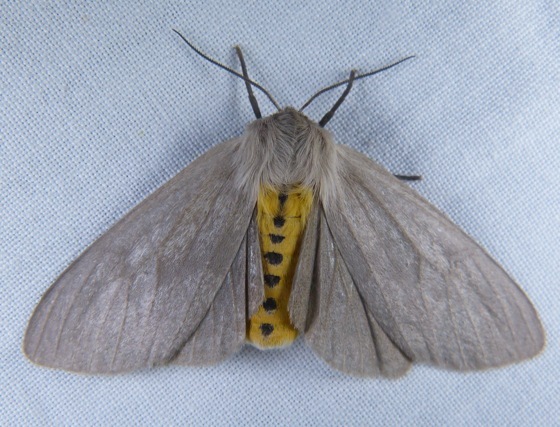 This is what they’ll turn into – an adult Milkweed Tussock Moth (from July 2012). 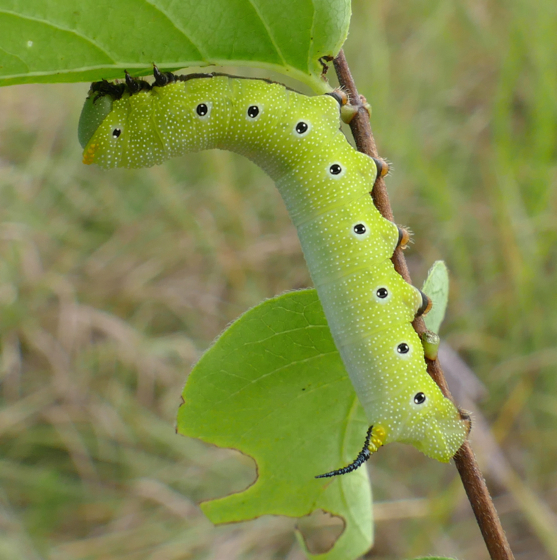 This is the caterpillar of a Snowberry Clearwing – the adults hover to drink nectar from flowers, and look like small hummingbirds. 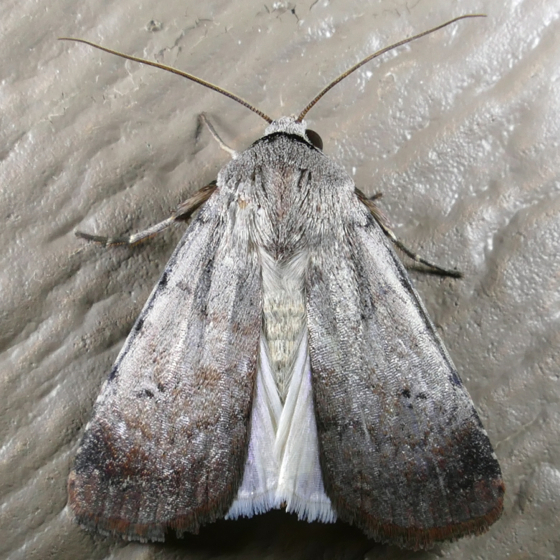 They’re unusual moths – I don’t see them often – but I found 3 of their caterpillars this week. 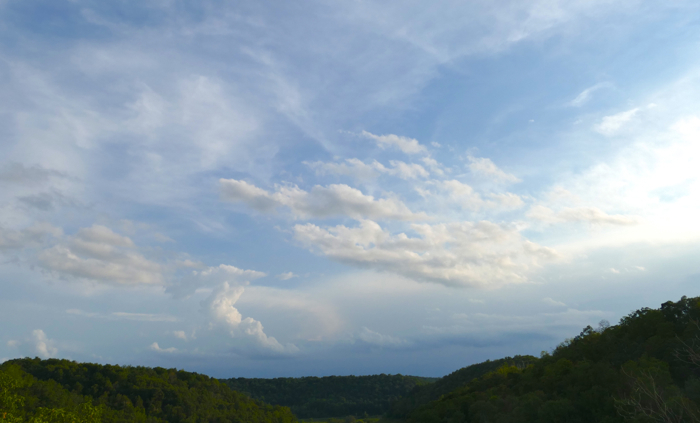 My new camera has an HDR (high dynamic range) setting, so I’ve been experimenting with photos of the sky. 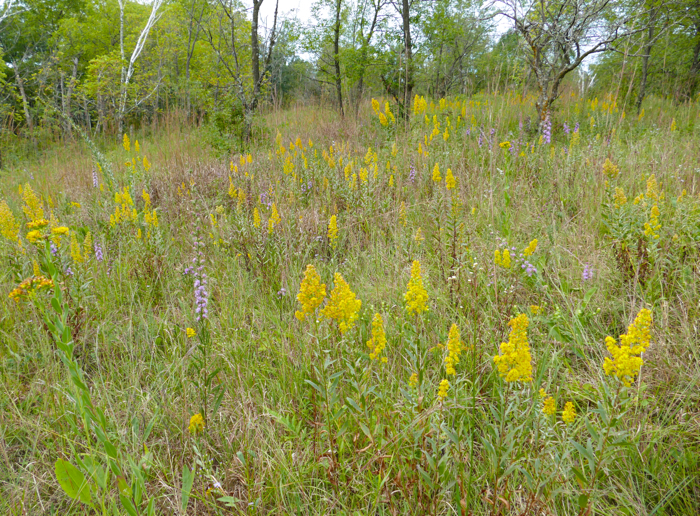 Some of our early planted prairies have too much Canada Goldenrod, but they’re still beautiful at this time of year – 3 Finger Valley. 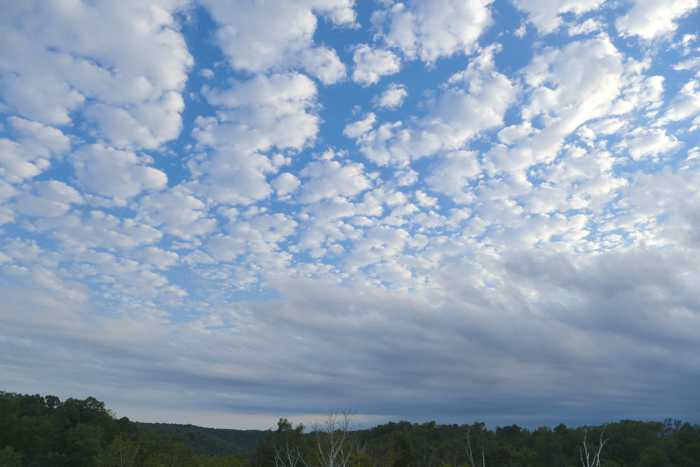 We had our first below freezing temperature last night – 29 degrees in our valley. 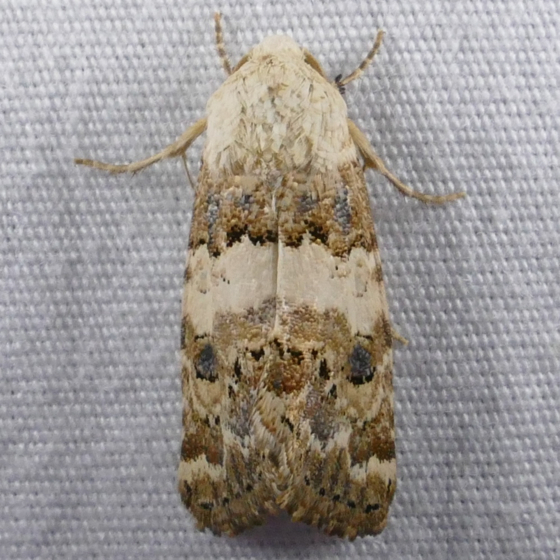 So mothing is slowing down for this year. 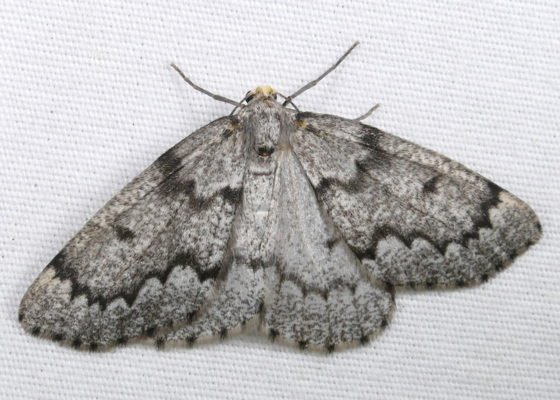 Here are some creatures from the last few good moth nights. 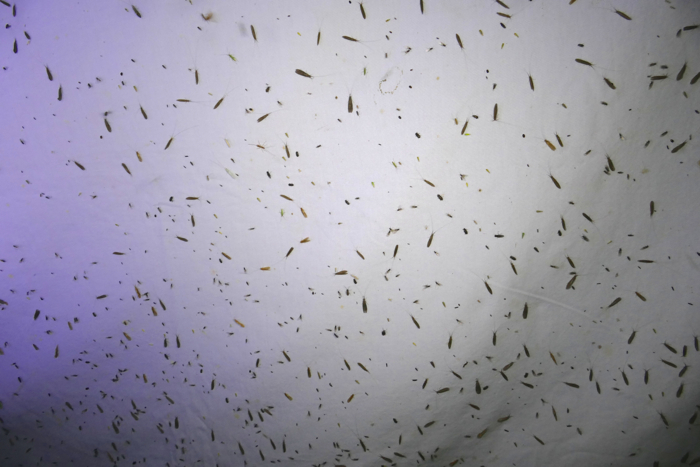 These are almost all caddisflies – not moths. 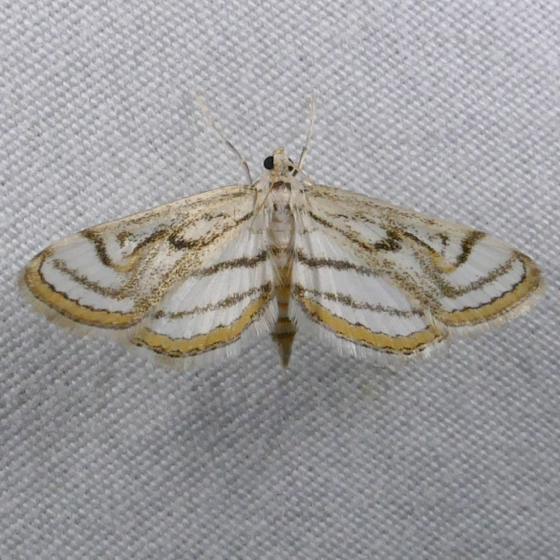 This was a very warm evening, and my whole sheet was covered with them – many more caddisflies than moths. 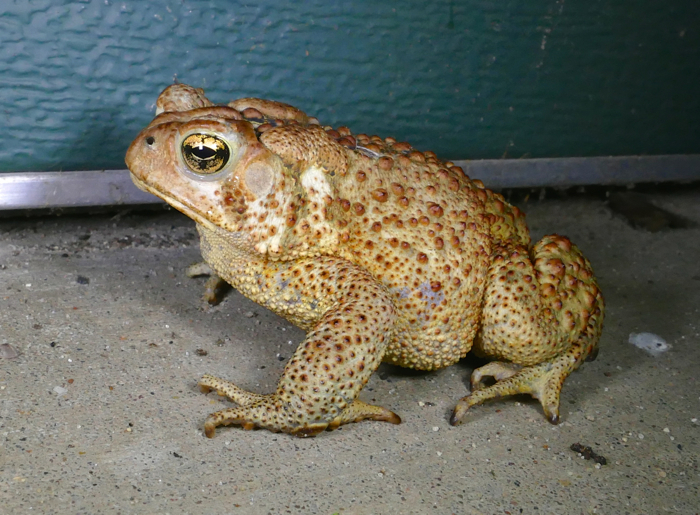 An American Toad was sitting at the bottom of the sheet, waiting for dinner to fly by. 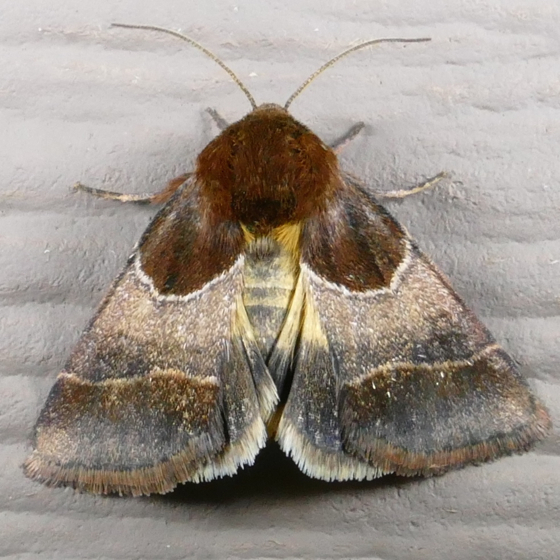 This was a new moth for the farm – one of the Flower Moths – Schinia tertia. Its caterpillars eat the flowers of Dotted Blazing Star, which we have growing right in front of the house. 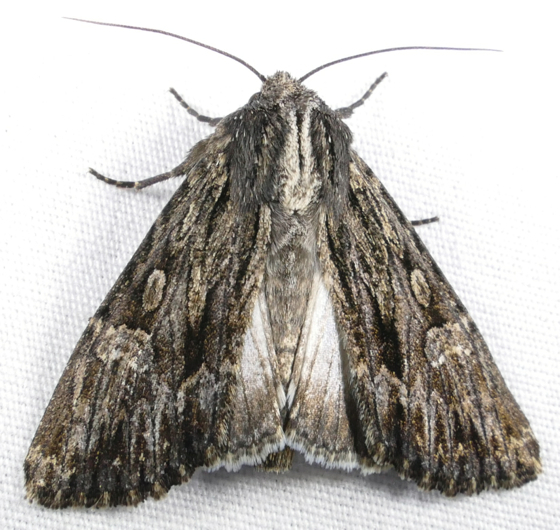 False Hemlock Looper – one I don’t see often, maybe because its caterpillar eats the needles of coniferous trees, and we don’t have many of those. 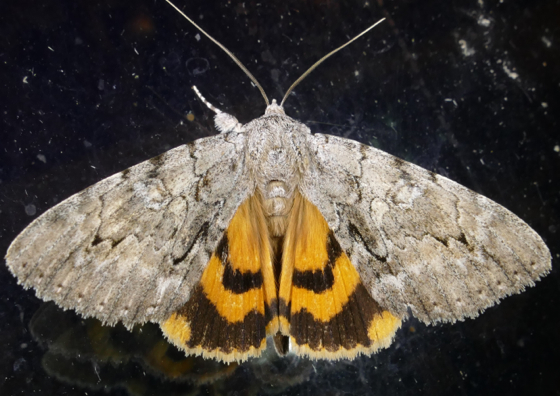 Apamea relicina – another unusual one that doesn’t even have a common name.